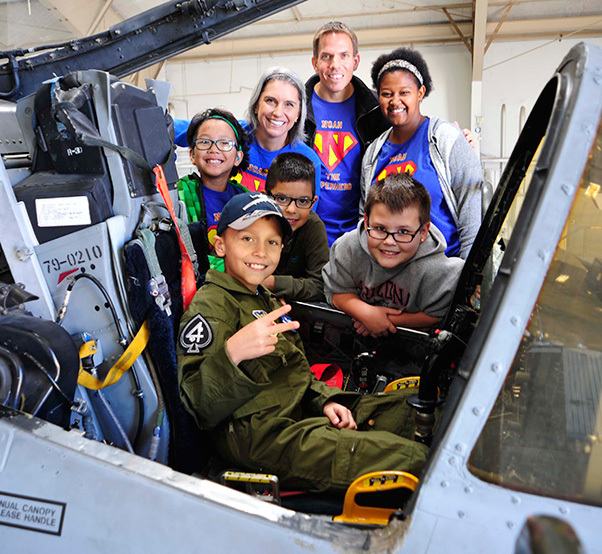 Noah Hepner, 10, poses for a photo with his family and friends in front of an A-10C Thunderbolt II during his visit to the 47th Fighter Squadron as part of the “Pilot for a Day” program at Davis-Monthan Air Force Base, Ariz., Dec. 4, 2016. 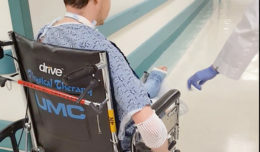 The goal of the program, which focuses on children of all ages who have terminal or chronic conditions, is to give each child and family a special day and a break from the daily challenges they face. DAVIS-MONTHAN AIR FORCE BASE, Ariz. — The 47th Fighter Squadron at Davis-Monthan Air Force Base, Ariz., hosted a local Tucson child as part of the “Pilot for a Day” program, Dec. 4. The program focuses on children of all ages who have terminal or chronic conditions. The goal of the program is to give each child and their family a special day and a break from the daily challenges they face. The honoree for the day was Noah Hepner, 10. He was diagnosed with high risk Acute Lymphoblastic Leukemia, August 2015. He arrived at the base excited and nervous but he didn’t face the unexpected alone. He was joined by his parents, siblings and two best friends. Capt. Keith Madsen, 47th FS A-10C pilot, volunteered to “train” Noah for the day. The squadron had one plan for Noah. 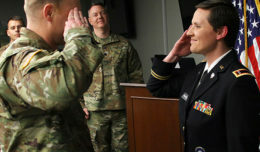 “We want him to forget about his daily life and focus on getting into the role of becoming a fighter pilot,” said Madsen. “It was a rough year for us, we’ve spent every holiday and birthday in the hospital because he’s been so sick,” said Lisa Chuinard, Noah’s mother. Noah’s disease has prevented him from doing most things that healthier 10-year-olds get to do. He missed his entire fourth grade year of school and rarely hangs out with other kids because of his compromised immune system, which means germs are life threatening to him. The day was a welcomed break for the family. Noah shyly stood in front of fellow 47th FS pilots, in his personalized flight gear, to be indoctrinated into the honorary pilot training program. After the ceremony he and his family headed out to see the A-10C Thunderbolt II up close and personal. 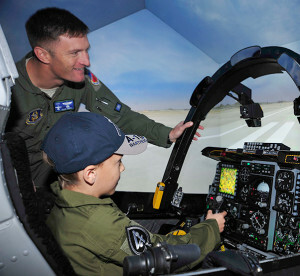 Noah Hepner, 10, is guided by Lt. Col. Dylan Thorpe, A-10C instructor pilot, as he takes off in the A-10C Thunderbolt II simulator during his visit to the 47th Fighter Squadron as part of the “Pilot for a Day” program at Davis-Monthan Air Force Base, Ariz., Dec. 4, 2016. Noah was diagnosed with High Risk Acute Lymphoblastic Leukemia, August 2015 and has two more years of treatment ahead of him. “Whoa! We actually get to sit in the cockpit!? !” said Noah. The squadron was aware that Noah’s favorite thing to do was playing video games so they planned plenty of time for the A-10C aircraft simulator. After a basic rundown of what the flight controls do, Noah had his bearing. Everyone was left in awe of how quick he picked it up. “He’s a natural. Look at that control, it’s amazing,” said Madsen. For the full pilot experience the aircrew allowed Noah’s siblings and best friends to sit in another simulator and play against Noah. After some well spent time in the simulator, Noah headed to the one other place he wanted to go to, the Armory. He learned about the various different weapons and how they operate. Noah completed his “training” and the 47th FS made it official in front of the entire 924th Fighter Group.